The double bass. Everyone knows the double bassit goes "boom, boom, boom." Sometimes, to paraphrase Sophia Loren, it goes "boom, boody, boom." In the hands of a virtuoso it does so much more than that: it has passion, dynamism, emotion and the power to move the soul. 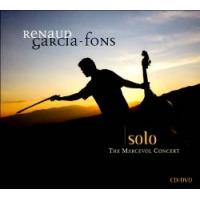 Renaud Garcia-Fons is such a virtuoso and Beyond The Double Bassa compilation drawn from ten previous albums, with an accompanying DVD documentaryis absolutely superb. Garcia-Fonswho favors a five-string double bass on all but one tunewas born in Catalonia and now lives on the outskirts of Paris. His musical influences are many: as suggested by the instrumental line-up to be found across the 14 tunes. Flamenco, European classical, Indian, North African, prog rock and jazz all find their way into his compositions and his playing, but this cross-fertilisation along with his stunning technical ability creates a uniquely beautiful sound. 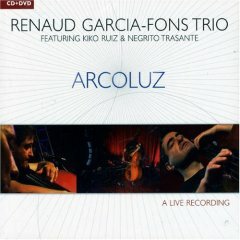 Whether playing pizzicato, arco, or in a combination which he calls "pizz d'arco" Garcia-Fons displays a mastery of the instrument. 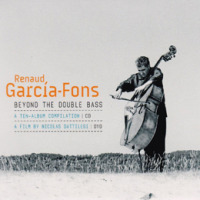 Beyond The Double Bass draws on Garcia-Fons' 20 year discography as leader, from Légendes (Thelonious, 1992) to the live Solo, The Marceval Concert (Enja, 2012), plus two new compositions recorded in 2013. The tunes range from the large ensemble sound of "Wadi Rum," based on the Tegui rhythm of the Sahara, to the solo bass compositions "Funambule" (played on a four-string) "Palermo Notturno," where Garcia-Fons uses electronic sampling to create an orchestral feel, the previously unreleased "En Mi Barrio" (dedicated to Luis Bunuel) and "Voyage À Jeyhounabad." The accordion, played by Jean Louis Matinier or David Venitucci, is a strong presence alongside Garcia-Fons' double bass. Matinier is notable on "Al Camarón," a tribute to the great flamenco singer Camarón de la Isla. It's a striking quartet performanceYves Torchinsky on second double bass and Jacques Mahieux on drums complete the groupfull of energy and positivity. Matinier also joins Garcia-Fons (performing as the duo Fuera) on "Bari," a romantic mid-tempo waltz. Flamenco guitarin the hands of Antonio "Kiko" Ruizalso features on many of the tunes. "Berimbass" is a sultry, spacious, trio performance from Garcia-Fons, Ruiz and percussionist Jorge "Negrito" Trasante. The graceful "La Linea Del Sur" combines bass with Venitucci's accordion, Ruiz' guitar and Pascal Rollando's percussiona tribute to Astor Piazzolla that mixes tango, flamenco and jazz. The recordings on Beyond The Double Bass are consistently excellent, but one of the previously unreleased recordings stands out even in this exalted company. "Camino De Felicidad"a Latin-inspired duet between Garcia-Fons and his daughter, Soleá Garcia-Fonsis exquisite. Father and daughter set up a percussive groove over which Renaud's arco bass and Soleá's rich and romantic voice weave the melody: a beautiful and immediately engaging song. Track Listing: En Mi Barrio; Aljamiado; Oriental Bass; Berimbass; Entremundo; La Linea Del Sur; Wadi Rum; Hommage À Ostad; Al Camarón; Palermo Notturno; Funambule; Camino De Felicidad; Bari; Voyage À Jeyhounabad. 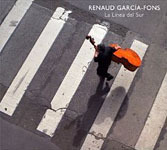 Personnel: Reynaud Garcia-Fons: double bass, palmas, percussion; Soleá Garcia-Fons: vocals, palmas; Claire Antoinini: lute, zither; David Venitucci: accordion; Jean-Louis Matinier: accordion; Antonio "Kiko" Ruiz: flamenco guitar, palmas; Adel Shams El Din: riqq; Yves Favre: trombone; Chris Hayward: flutes; Henri Tournier: flutes, bansuri; Bruno Sansalone: clarinets; Pierre Hamon: bagpipes; Hakan Gungor: kanoun; Françoise Couvert: violin; Philippe Couvert: violin, Franck Pichon: violin; Yves Torchinsky: double bass; Rabh Khalfa: derbouka, tar, bendir; Dahmane Khalfa: carcabas; saguetes, tbel, derbouka, bendir; Rhaba Khakfa: derbouka, carcabas, bendir; Bruno Caillat: tablas; Gaston Sylvestre: cymbalum; Sam Schlamminger: daf; Franck Tortiller: marimba; Jorge "Negrito" Trasante: drums, percussion; Jacques Mahieux: drums; Pascal Rollando: percussion.